The new EMODnet Chemistry marine litter maps show the distribution of litter in beaches and seafloor. The maps are freely accesible through the OGC web services from the EMODnet Chemistry portal, selecting Beach Litter or Sea floor litter layers. Survey locations with indication of the litter reference list used to perform the survey. Temporal coverage and number of surveys present in the database. Litter mean abundances and material percents. Mean abundance of cigarette related items, fishing related items and plastic bags. Density (items/km2) of fishing gear related litter types and plastic bags. Beach, seafloor and micro-litter data are also available through EMODnet Chemistry Data Discovery and Access Service. Beach litter data collection has been achieved thanks to the positive cooperation with OSPAR, JRC, DeFishGear, EMBLAS and MSFD Technical Group on Marine Litter, and to the work done by the EMODnet-Chemistry consortium. Seafloor litter data collection, were only possible thanks to the synergy and active interaction with ICES, MEDITS, and to the work of the EMODnet-Chemistry consortium. Want to know more about the maps and their usage? Read the press note in the EMODnet Central Portal. These maps are available also in the European Atlas of the Seas. Read about the map of the week, and visit the map. 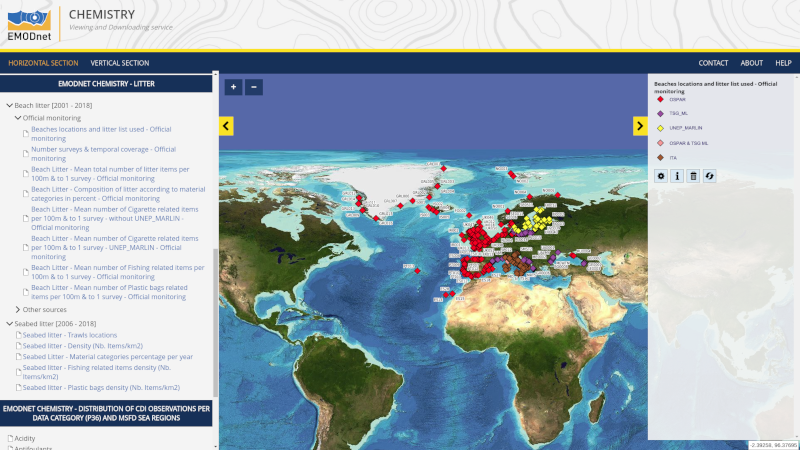 Explore Marine Litter page for more information about marine litter data and products.